This author Georgieanna Gross has created 8 entries. We were absolutely thrilled to return to Lake Eola this year for our second opportunity to join Down Syndrome Association of Central Florida at their annual Step Up for Down Syndrome Buddy Walk hosted at Lake Eola. October 22nd was one of the first beautiful fall mornings that us Floridians are grateful for after a long hot summer, and as the Guardians crew assembled on either side of the starting line, we were anxious to get the walk started and make some memories with some wonderful children. Guardians of Justice recently traveled to Estero, FL for a fun-filled day at Kaikoa’s Beach Bash hosted by Salt Warriors, a Ft. Meyers non-profit organization. Salt Warriors “fight for local charities” by organizing fundraisers on their behalf to raise money for local families. This one in particular was for duel-charities, Caleb’s Crusade Against Childhood Cancer and The Kira Foundation. Nestled on a beautiful piece of shoreline, beach bums came out to enjoy a warm sunny afternoon of music, food, and craft beer to party for a cause–raising funds for childhood cancer. 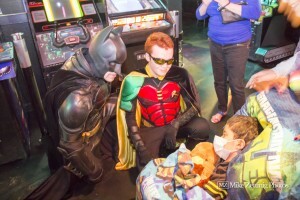 This past weekend, Guardians of Justice members teamed up for a very special mission to celebrate the life of a 6 year old boy, named Armani Cintron. This little man was diagnosed with a rare form of brain cancer (Anaplastic AstroCytoma) just over a year ago and is currently battling in Stage 3 after he has went through radiation and chemotherapy. Early last month, January 2016, his family received news from their specialists that the tumor had unfortunately progressed. Without question, this courageous boy – who is aptly known as an active and lively child – was in fierce need of a positive pick-me-up. Guardians of Justice members spread some holiday cheer at Outreach autism Services Network’s Christmas party hosted in Ocala this past weekend. 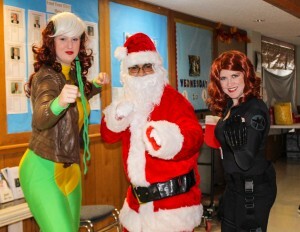 Although it was a small group for such an occasion during this most wonderful time of the year, Rogue and Black Widow were able to share and experience quality moments with over 80 families in attendance. We laughed, we smiled, we danced, we ate pizza. So. Much. Pizza. 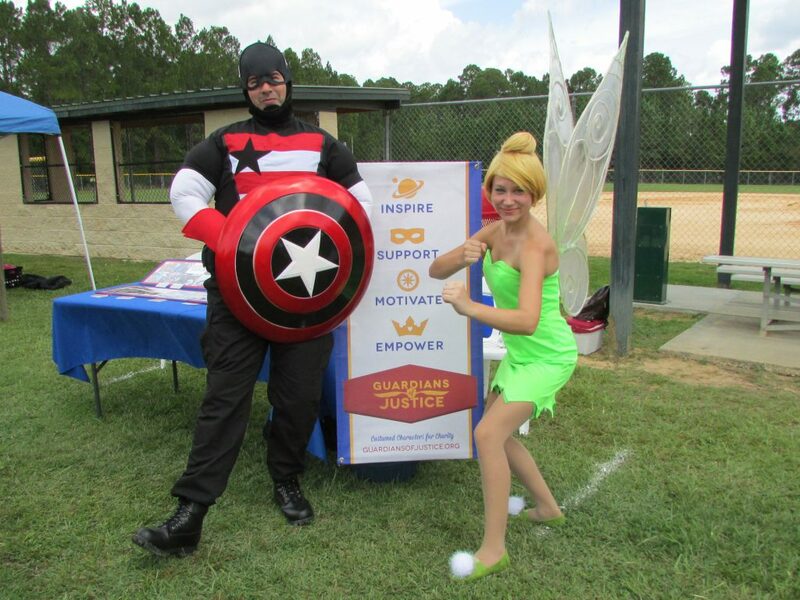 Members of the Guardians of Justice crew were back at it again this weekend, making an appearance at BASE Camp’s Christmas in July event this past Friday, July 24th at Rosen Shingle Creek. This was BASE Camp’s 18th annual event of this kind where children battling cancer and their families can all get together to celebrate a wonderful evening of music, dancing, and prizes along with tons of other yummy food and snacks. Rogue, one of our own, even boasted that it was quite possibly the BEST mac & cheese she’s ever had. Santa also made the trip down from the North Pole sporting a Floridian-inspired vacation ensemble and was available for photo-ops with the little ones. Gods & Monsters Grand Opening Extravaganza! 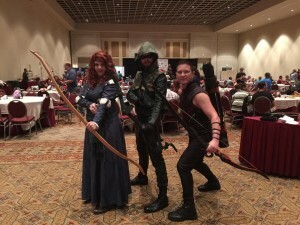 This past weekend, Guardians of Justice team members were invited to be a part of something truly exciting for fanboys and girls everywhere around the Orlando area! 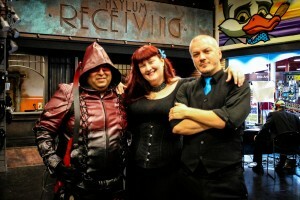 The grand opening of Gods & Monsters, boasting to be the second largest comic book store in the United States initiated their red ribbon ceremony on Saturday, June 13th in the Artegon Marketplace on I-Drive, and we had an absolutely great time being a part of it. As people walked through the threshold of this pride & polished nerd mecca for the first time, the Guardians of Justice gang were there to greet them!